This is now the 3rd time we have stayed here in the Penthouse apartment with the pool on the roof. Can't think of a better place to stay and watch the sunset over the mountains and Port Douglas as the view. These apartments and exceptional and maintained to perfection. Ideally located with all that Port Douglas has to offer on the doorstep. These apartments are located perfectly. Near the beach, in the shops amongst wonderful restaurants and pubs. The units are spacious, well designed and luxurious. We had a pool which we loved! The staff to check you are are also very helpful and friendly. I think whilst the pool ones are expensive - it is like everything -what you get you pay for. Just do it - they are worth it. Perfect location in town, a very short walk to beach and close to all restaurants and shops! We asked for a rooftop apartment and it was amazing, make sure you book in advance as they were completely booked out when we were there! Special Thankyou to Nikki who was just lovely throughout our stay and helped with recommending and booking our tours and dinner reservations all week! If you're thinking about treating yourself in Port Douglas, you can't go past these luxurious, spacious apartments! Our second visit to Port Douglas without a doubt much better than where we stayed last year. Most staff very helpful . Had five nights in a balcony apartment which was nice and clean well appointed and lovely. Next 4 nights upgraded to a penthouse do yourself a favour if you can afford it get one of these. Plenty of room for a bbq,fridge and sink large table lounge chairs banana lounges a private pool big enough for at least 4 people and a spa plenty of shade for those who do not like the sun. Great views and plenty of doors and windows you can open for fresh air. Not far from the beach and all bars and restaurants. Excellent place to stay both rooms very clean and spacious. Will be back in the next few years. We were delighted with our duplex apartment at Coconut Grove. It was spacious, well equipped, immaculate, plus a plunge pool, hot tub and private terrace. Amazing. Its a great location, a short stroll from the beautiful beach and very handy for the town, shops and restaurants. We loved it and will definitely come back. Very helpful reception too! Not long enough is my only complaint! Casual, but classy describes these gorgeous apartments and the location is ideal. Fully appointed, even with plastic wrap and foil, we wanted for nothing. We cooked on our BBQ each night and ate outside by our private pool, whilst overseeing the goings on in Macrossan St. The staff are friendly and made us feel very welcome. 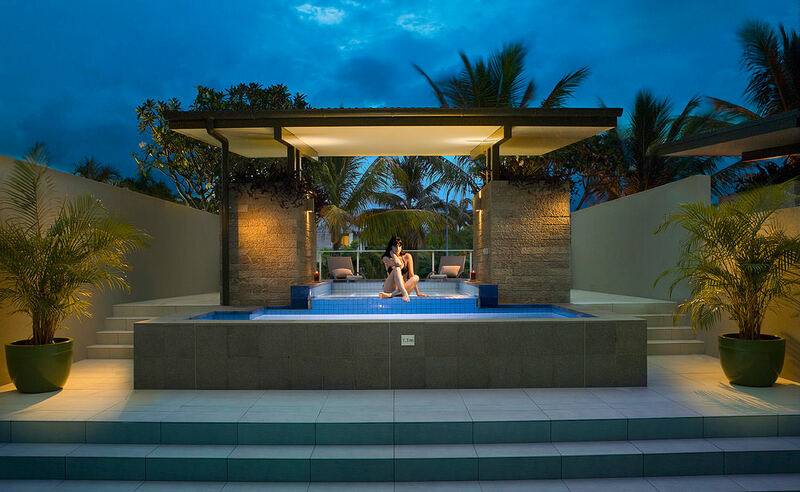 Staying in Port Douglas to celebrate one of life's milestone birthdays and to avail ourselves of the excellent dining establishments, we sought accommodation in Port itself. The Coconut Grove Apartments are ideally located on the eastern side of the CBD, away from noisy pubs, yet within a few hundred metres walk of the best dining Port Douglas has to offer. The famous Four Mile Beach is but a few minutes walk away, with the foot bath provided for guests to wash the sand off their feet on their return! Our two bedroom apartment was superb; tastefully furnished; spa bath in the master ensuite and a full complement of Miele appliances throughout. It's perfect for that extended stay, where you can travel light with all the conveniences of home. Outdoor living was no exception either, the balcony equipped with a stainless steel BBQ, bench-tops, under bench fridge and sink. An outdoor dining table seating six made our Sunday brunch with friends a most enjoyable repast. If you are looking to keep away from the plethora of resorts that surround Port Douglas, and want top quality accommodation with peace and quiet, look no further than Coconut Grove Apartments. It's certainly on our return list. 10/10 Coconut Grove. The accommodation was spacious, clean and tranquil. Our amazing apartment had it's own private deck overlooking the ranges with a massive entertaining deck, heated plunge pool and spa. Friendly staff, clean apartment with everything you'll need, plus a cheese and biscuit welcome plate upon arrival. Coconut Grove has the ideal location, only a minutes walk to 4 mile beach and above the main restaurant strip. We will definitely be back! All the guests from the wedding we attended at Sugar Wharf were jealous of our fabulous home base for the week. Absolutely no negative feedback for Coconut Grove! Highly recommended! We loved our stay in Port Douglas overlooking the main street from the 3 bedroom Penthouse. The apartment is gorgeous with a well appointed kitchen and comfortable furniture. The rooftop pool and outdoor living space was great for barbecuing and relaxing with our kids for a mid vacation break. The location is convenient with walking distance to many outstanding restaurants. Port Douglas is a great launching location for all the outdoor activities of the area. Parking is secure in a garage beneath the units.